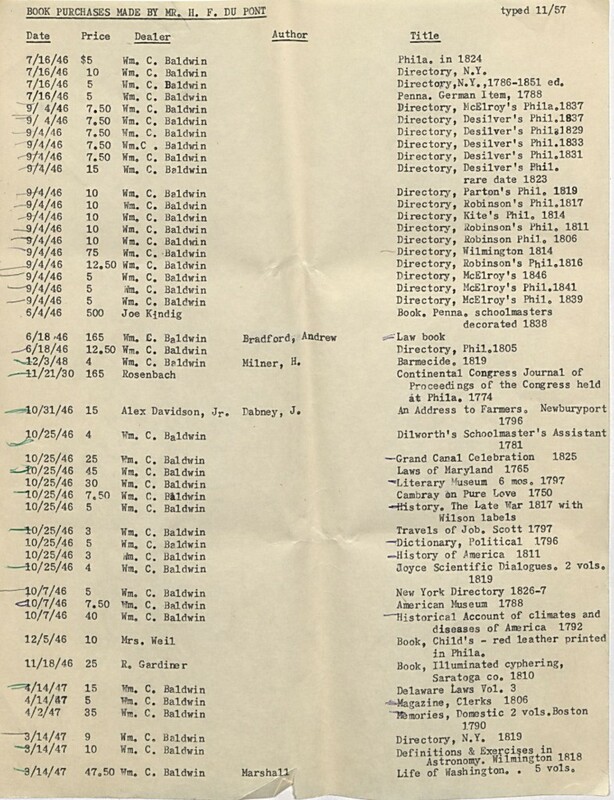 In the 1940s Henry Francis du Pont began collecting material for a scholarly research library. He envisioned a graduate training program at Winterthur and knew that graduate students in the decorative arts would require a library with original materials from the 1500s through the 1800s. He believed that original sources were critical to understanding museum objects and the periods in which they were created. 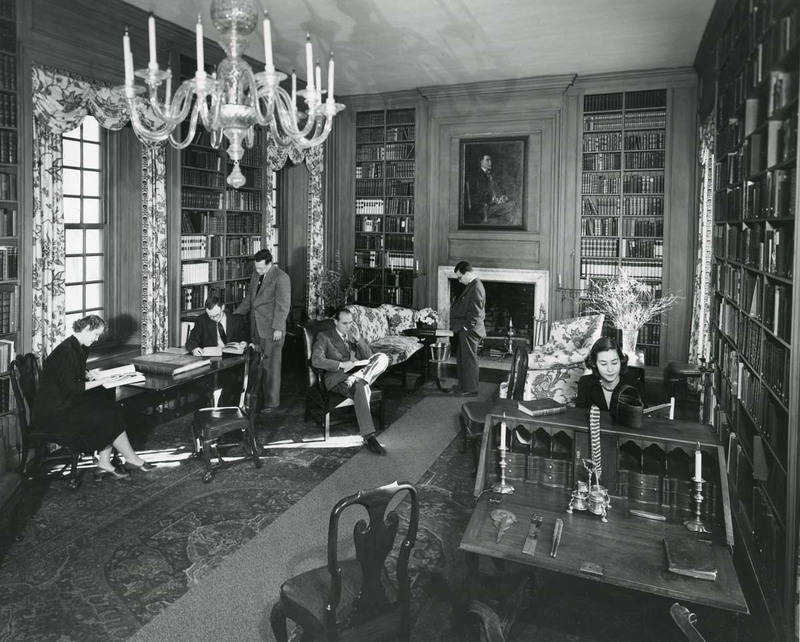 In the late 1940s, when du Pont hired staff for the museum and library that was to open in 1951, those professionals assumed responsibility for expanding du Pont’s rare book holdings. Frank Sommer, the first library director, and Charles Montgomery, museum curator and later museum director, embarked upon a remarkable book-buying spree in anticipation of the 1952 debut of the Winterthur Program in Early American Culture (WPEAC), now known as the Winterthur Program in American Material Culture (WPAMC). The purchases made by Sommer and Montgomery covered a broad range. Materials included technical treatises, design sources, early periodicals, trade catalogues, production manuals, and even drawing books. [See full list.] In combination with du Pont’s early acquisitions, these original works provided outstanding resources for the museum’s graduate students, curators, and visiting scholars and contributed to the foundation of Winterthur Library. The following books appear on this list. 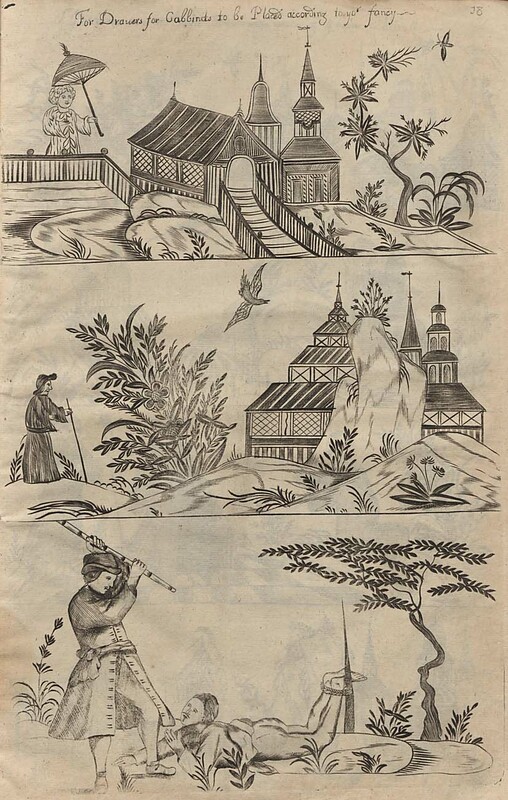 Stalker and Parker’s 1688 manual for creating japanned (lacquerlike) decorations on surfaces dates from the height of England’s infatuation with the Orient. 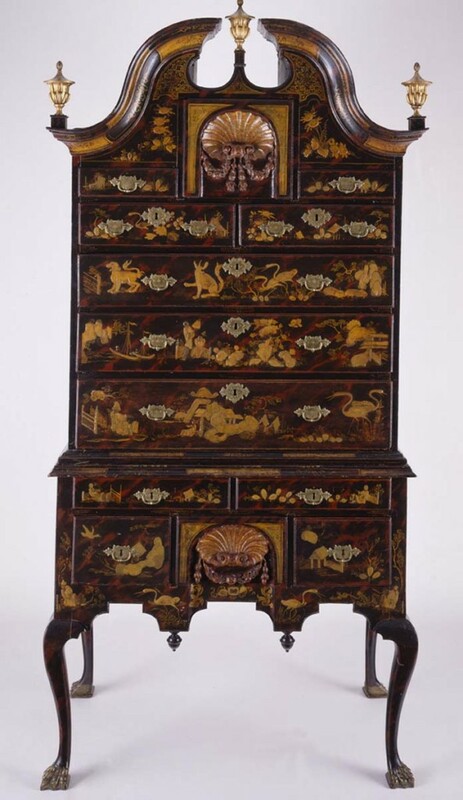 Artisans would have consulted publications such as this one when producing objects like the high chest. 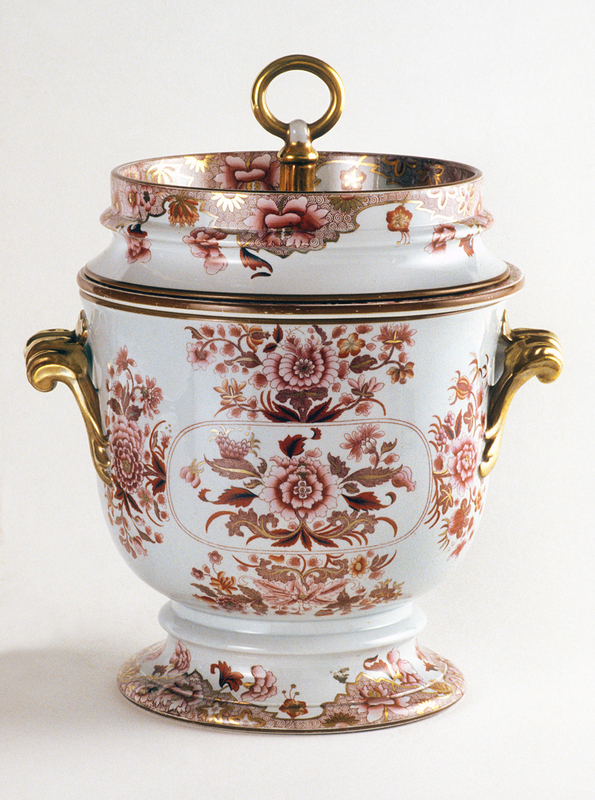 Many English looking glasses in the neoclassical taste were exported to America. 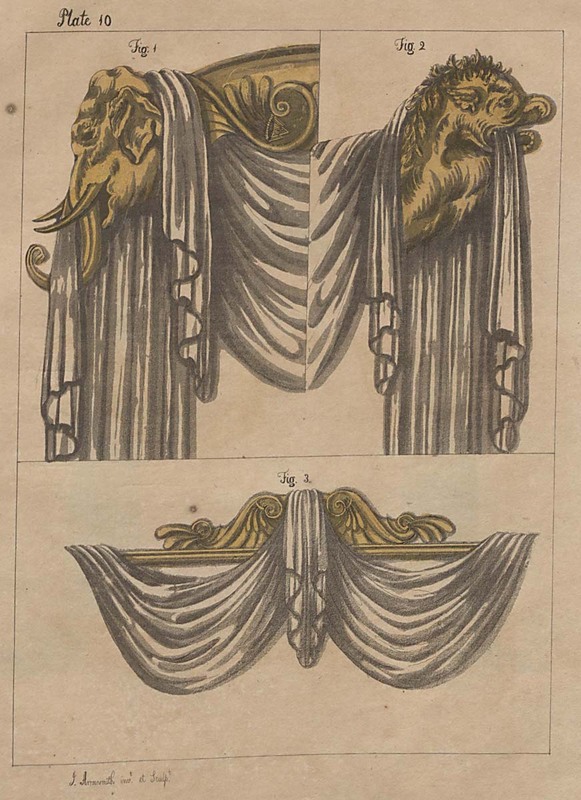 This example is similar to plate 117 in Hepplewhite’s Cabinet-maker and Upholsterer’s Guide, one of the most popular design books of the late 1700s. 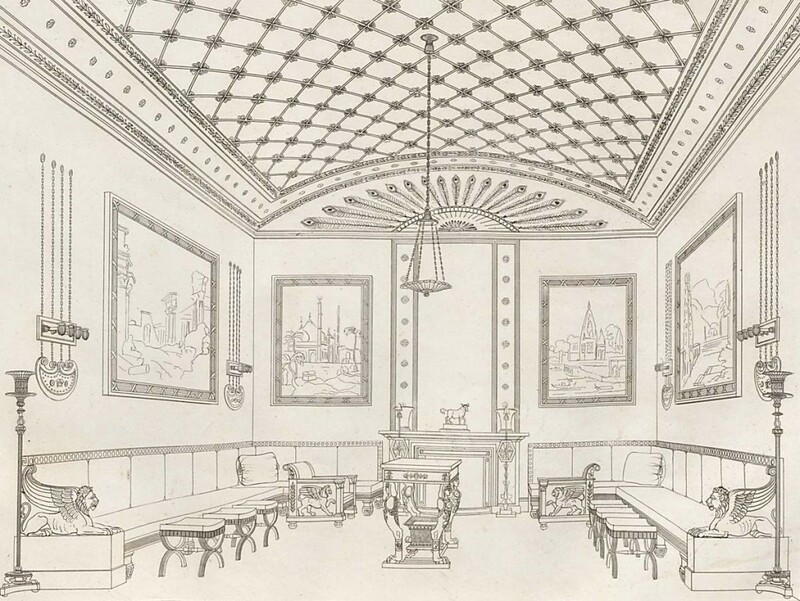 The Repository of Arts, Literature, Fashions, &c.
Rudolph Ackermann was an entrepreneur whose fashionable London store sold prints, books, art supplies, and fancy goods. 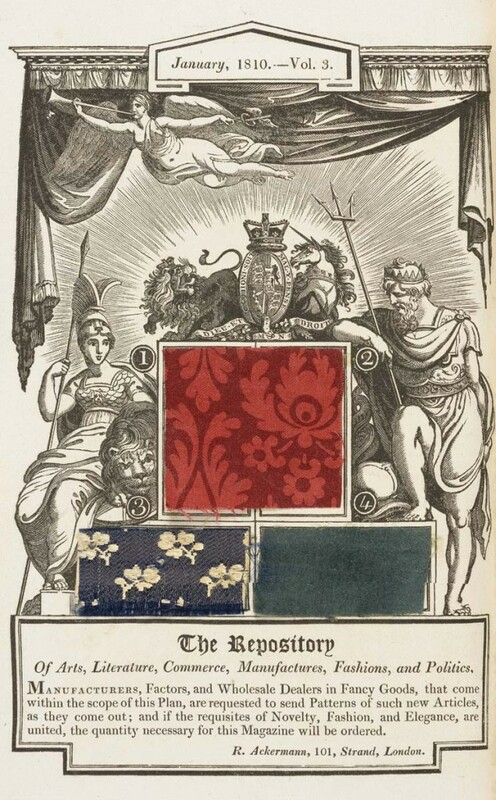 His popular periodical, The Repository of Arts, promoted his store and contained poetry, art and music reviews, fashion plates, and fabric samples. It influenced taste in both Britain and America. The vivid color scheme of the room pictured here included sky blue walls, crimson sofas, and a ceiling of pale yellow intermixed with azure and sea green. Thomas Hope published this book to document the classical interiors he designed and installed in his London home. His individual and high-style designs were based on years of study and travel throughout Egypt, Greece, and the eastern Mediterranean. 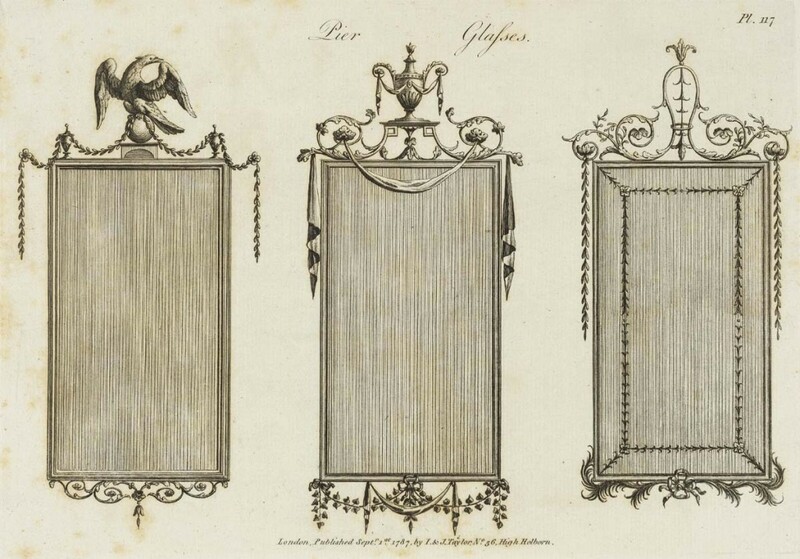 Elaborate draperies were a major feature of fashionable interiors in the early 1800s. This influential book of drapery design includes tables for determining yardage and advice on decorative hardware. 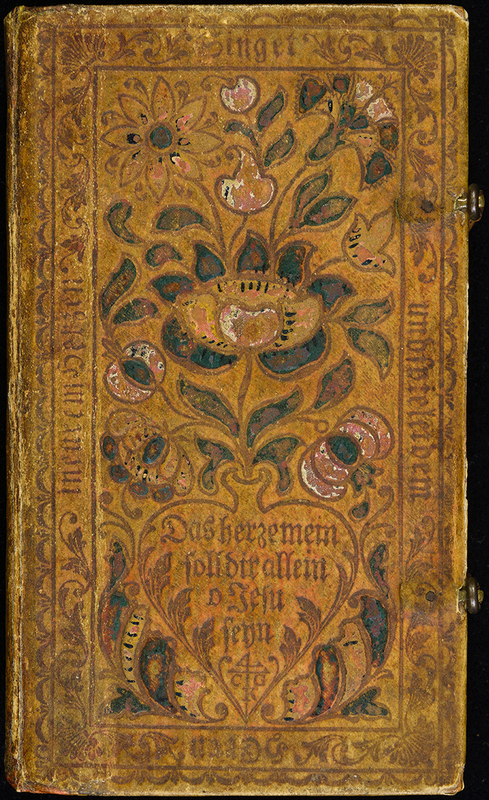 The title page notes that it was sold at Ackermann’s shop. 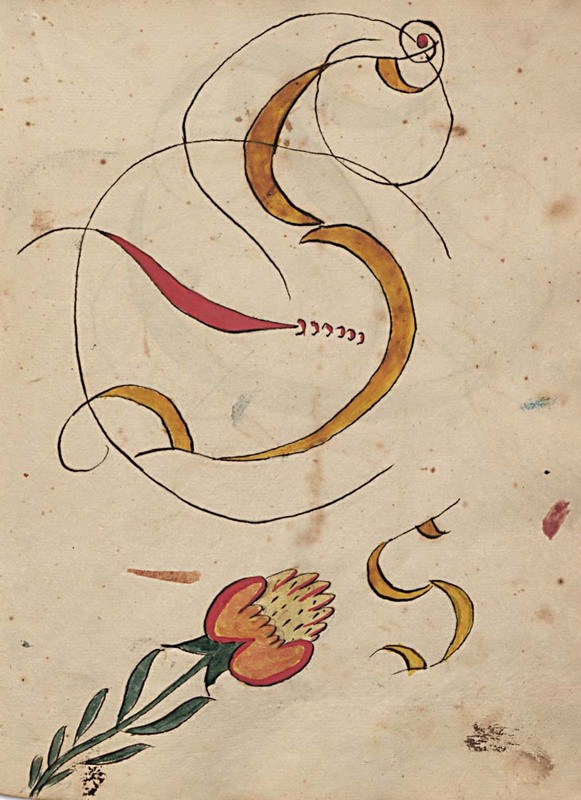 Collectors such as H. F. du Pont would have consulted this book when making design decisions. 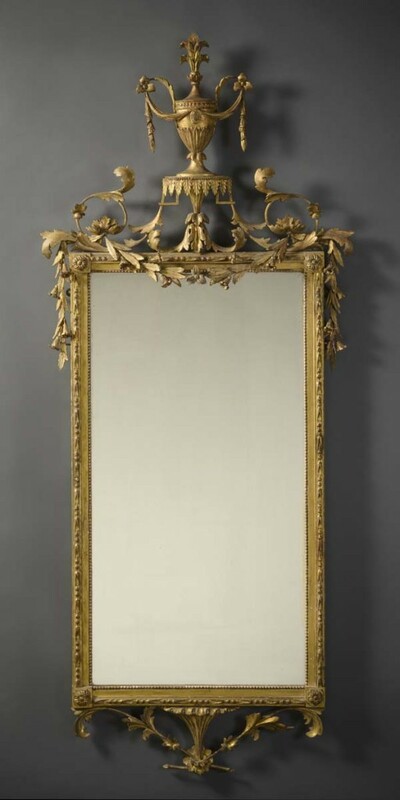 In the 1800s, manufacturers published trade catalogues that gave wholesale and retail merchants images, specifications, and prices for their wares. 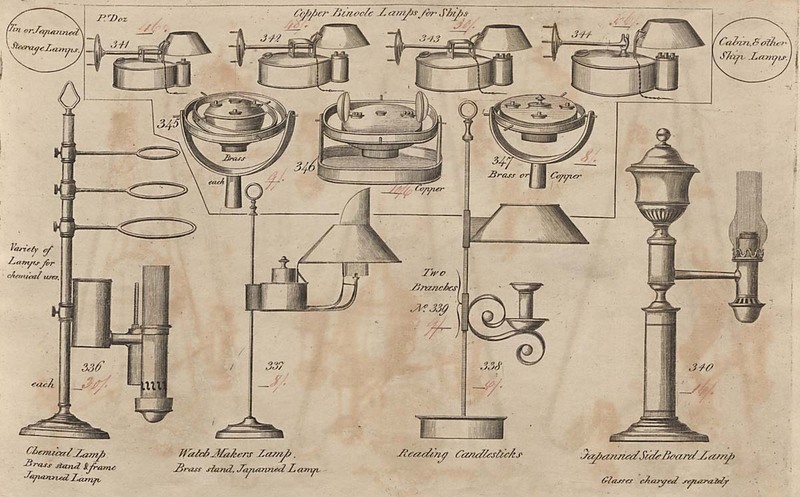 These catalogues tell us much about the products available to consumers in a given period. 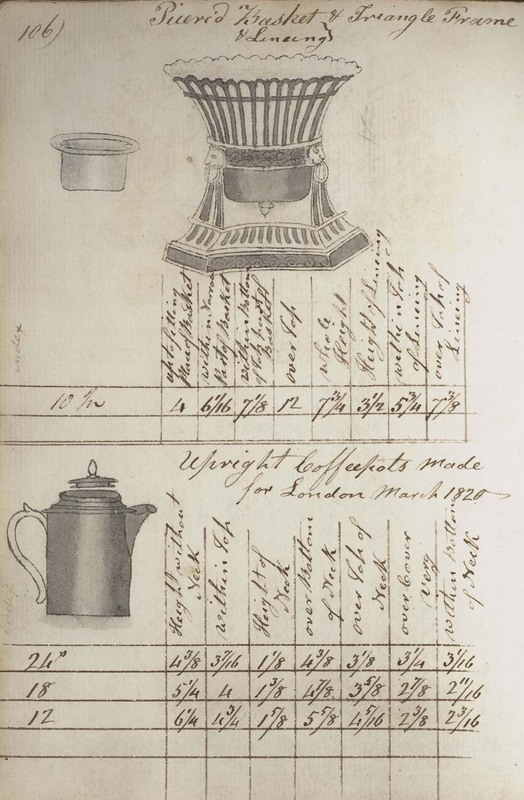 Made by W. T. Copeland and Sons, Ltd.
Spode, an important English pottery firm, used this book in its London warehouse to record the standard shapes and sizes of porcelain produced in its Stoke-on-Trent factory. The book reveals typical production practices of a firm that exported many wares to America. It also documents how individual objects like this glacier were made. Glaciers were fashionable serving dishes for ice cream. Ice in the base of the bowl helped to keep the dessert chilled. In Pennsylvania German schools, students learned fine handwriting by copying examples executed by the schoolmaster, such as the page seen here. 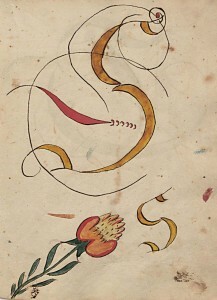 This same style of letters, birds, and flowers appears on pottery from the region and on bookbindings that immigrants brought with them from Europe. 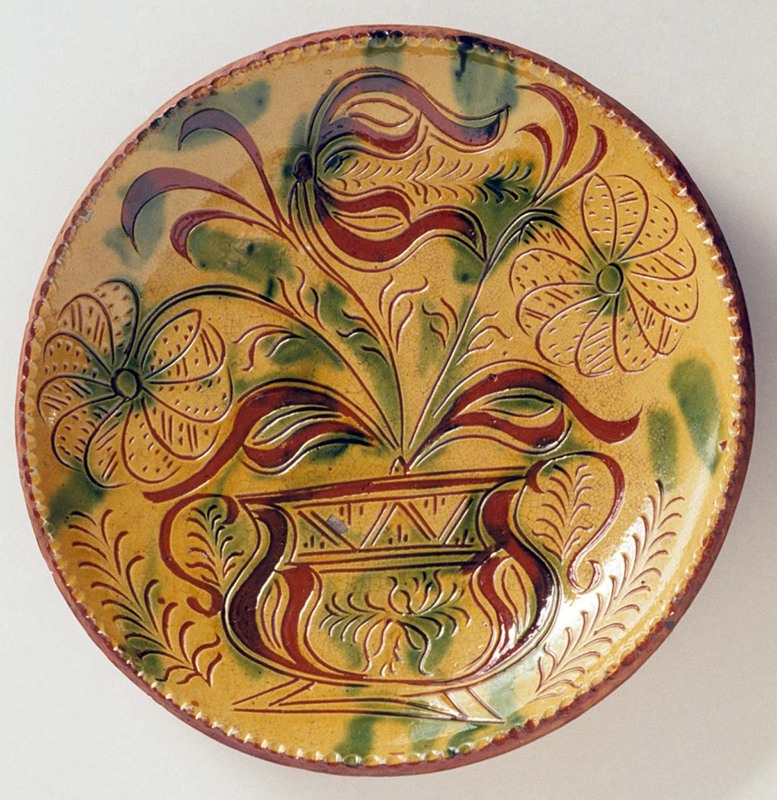 Through comparisons such as these, documents such as the schoolmaster’s book can help us understand how culture and design were transmitted from Europe to America.